Whenever you are searching for a party bus in Franklin, there will be moments where you are unsure as to whether or not you can trust the company in question. However, that is not an issue when you contact us here at Rockstarz Limousine and Party Bus as we not only specialize in delivering a stunning party bus, but we can assure you that you will all have a wonderful time. To rent a party bus, you will also want to make sure that you can invite along as many guests as possible. Due to this, we have sought to make the maximum use of the space that is available on our bus to then allow you to bring along even more people than ever before. 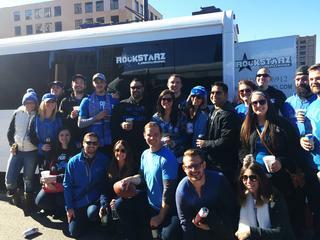 With our Franklin party bus rental service, we will always make sure that you and your guests have the best time possible. For us, the atmosphere is everything, and from the moment that you all step onto our bus, you will feel as if you have been transported into your own private nightclub. After that, you can cruise the city in style while you party the night away. Our Franklin party bus service comes equipped with a stunning stereo sound system that will blast your music throughout the bus. Furthermore, we have also included a laser light show that will just take that atmosphere to a whole new level. In the past, individuals have used our party bus to celebrate a number of different occasions. From a birthday, to an anniversary, bachelor and bachelorette party, the reason for the celebration does not matter as we can cater for everything. So, if you live in the Franklin area and are looking for a party bus for any occasion, then give us a call here at Rockstarz Limousine and Party Bus. Alternatively, you can contact us via our website and someone from our team will be in touch.